Sorting in Open and Save dialogs – what IS up with that? “How the heck do I change the sort order of my files in Open and Save dialogs?” We get this question a lot, and I can’t blame you for being confused. The controls for sorting the list of files in Open and Save dialogs are a bit of a mess. They’re the result of new features being layered on top of older user interface controls, leaving you with some odd and confusing combinations. In the beginning – well, OK, not The Beginning beginning, but quite a few years ago – you could only sort in file dialogs by clicking on the top of the columns in list view. If you want to sort by date, you click on the “Date Modified” column header. The little triangle at the right side of the header shows you whether you’re sorting in ascending or descending order. Clicking the header again toggles between ascending and descending. To sort by name, click on the “Name” header. Pretty simple, right? Click on those little buttons I’ve marked in red to change views. 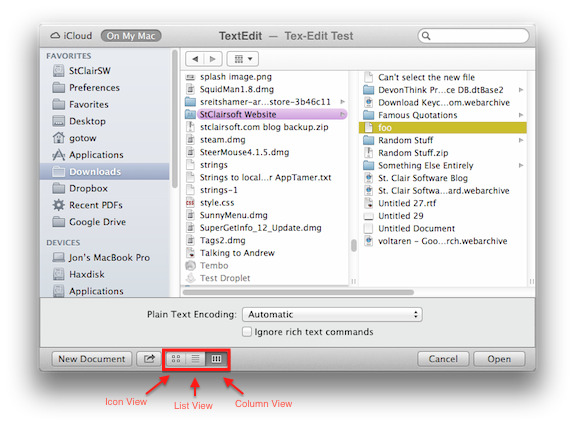 Note that they’re on the bottom of the file dialog in some applications, but at the top of the dialog in others. Don’t ask – that’s just the way it is. So.. 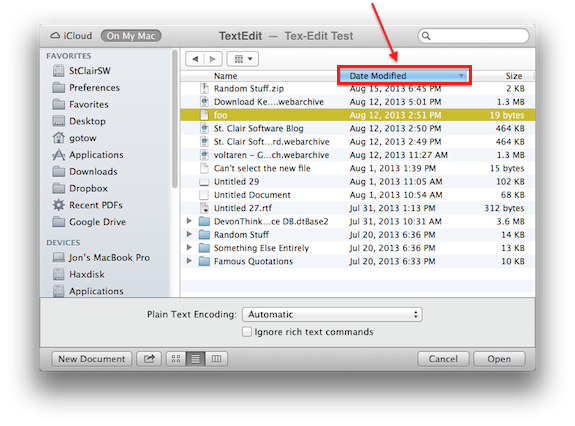 Method #1 for sorting your files: Click on the List View button and then on the column header you want to sort by. Selecting a sorting method from this menu gives you the new Finder-style sorting with interspersed headers saying “Today”, “Yesterday”, “Previous 30 Days”, “Earlier” etc – you can see them in the screenshot above. The confusing thing is that this will also sort List View windows that way, and will completely disable your ability to click on the column headers to sort the Old Way (what I called method #1). 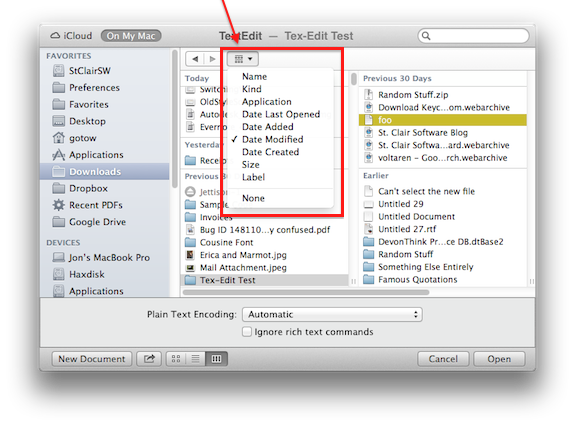 So… Method #2 for sorting your files: Click on the Sort Menu button and select a sorting method. And now the inevitable question: What if I don’t want those “Today, Yesterday, Previous 30 days” things in the way? I’m glad you asked – mostly because I don’t like them myself 🙂 If you want to go back to the Old Way of sorting in list views, start with the Sort menu and choose “None”. Then click on the List View button and click the column headers to select your sort method.